Nothing encourages demand more than being told you can’t have it, so five years after its launch operator requests led to the first Renault Range T High with a flat floor and the steering wheel in the right place landing in 2018, as Kevin Swallow reports. THERE was a suggestion that the French didn’t believe the UK market would take to a French built truck with a flat floor. After all, previous sales strategies focused on the Premium. Little, if any, effort was made to foist a ‘Magnum’ version (complete with a flat floor) onto hauliers and operators. However, the Brits weren’t willing to take ‘no’ for an answer, and T High cabs in left hand drive began to arrive this side of the English Channel. In June 2014, refrigerated haulage specialists, STS Logistics Oswestry, took the UK’s first Renault Trucks Range T520 high roof, flat floor sleeper in LHD. 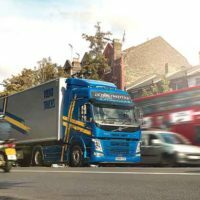 More would follow going to other hauliers. In February 2018 it finally came to pass. 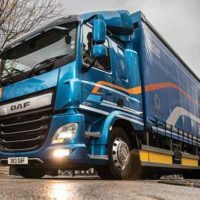 The Renault Range T High, complete with a flat floor and in RHD, was officially unveiled in the UK ‘in response to exceptionally strong demand’ and 10 demonstrators were put into the Renault Truck dealer network. When the Range T was launched, it was innovative, with its fresh new cab inside and out. 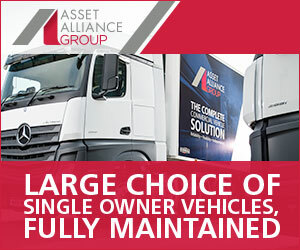 What was familiar was the engine, sharing many components from within the Volvo Group. What was different, Renault explained, was the differences in engine control software. The DTi13 12.8 litre engine is an in-line, six cylinder lump using exhaust gas recirculation (EGR), small enough not to require an EGR cooler, to aid and abet the selective catalytic reduction (SCR) to meet Euro 6 emissions. First generation DTi13s used unit injectors. In 2016 Renault installed common rail into its DTi13 engine, making it the same as the DTi11 10.8 litre engine, but retained the original horsepower at 440, 480 and 520, and torque with 2,200, 2,400 and 2,550Nm respectively. As well as adding common rail, Renault made a raft of changes to bring down the kerbweight. This included a roof spoiler without the metallic structure (optional), and weight taken out of the chassis, rear air suspension and drive axle. All contributing to a 114kg weight reduction. To improve fuel consumption, new aerodynamic bumper extensions and fixed roof spoiler were added as options, two new final drive ratios of 2.31 and 2.47 were added, and front wings equipped with anti-spray flaps could be adjusted to chassis type and wheel size. Also new was Optivision, Renault’s own predictive cruise control (PPC) system that reads topography and uses stored routes to apply the ‘most effective and fuel efficient gear shifting strategy’. For this test, the Range T High is fitted with the highest power rating from the DTi13 engine, the 520, which is a true rating of 512hp from 1,430 to 1,800rpm, complemented by 2,550Nm torque from 1,000 to 1,430rpm. The direct top gearbox is the Optidriver AT2612F, which provides 12 forward gears and three reverse gears, and is fitted with the new 2.47:1 rear final axle drive. Also, part of the vehicle’s specification is the Fuel Eco pack, which includes Eco cruise control that has an inhibited power mode to limit driving time outside the green zone. Once on the M74 northbound, it pulled 44 tonnes gross vehicle weight effortlessly at 53mph (Transport News’ chosen motorway speed to keep out of trouble) at just 1,100rpm in top gear. Using Optivision, the engine quickly settled on the first Beattock climb into 11th gear at 1,200rpm and climbed at 45mph. As we started to crest the hill at 49mph Optiroll was deployed and the truck dropped quietly into the small valley. Optivision has no qualms about asking the engine to hit the power when it has to, and the engine sprang into life at the start of the second part of Beattock at 56mph. At 47mph it dropped smoothly into 11th gear at 1,200rpm. On the longer drawn out hill climb northbound after Abington at J13 of the M74 the truck held top gear at 47mph at 1,000rpm rather than go down a gear. So at least the software isn’t too conservative and will let the engine work. Optivision’s performance with so much horsepower and torque is consistent with its competitors fitted with their respective PPC systems. And where possible it lets the engine dig in hard and doesn’t fall away even though it is going up the hills at lower speeds and lower revs than a truck without PPC. The three ECO settings each have different speed boundaries; ECO 1 allows the engine to fall 3mph before the engine kicks in from the pre-set cruise control speed and overspeed by 7mph before it uses the engine brake to reign in the speed; in ECO 2 its 2mph under and 5mph over; and ECO 3 only allows a 4mph overspeed, and this option is the only one not to use Optivision. On the timed hill climbs, the engine delivered competitive results. Up the 2.5 mile Cairnie Braes climb eastbound on the A9 Dunblane-Perth road starting at Findo Gask it arrived at the top in three minutes 18 seconds, six seconds off the pace compared to the current record holder; the Mercedes-Benz Actros1 2563LS with 630hp and 3,000Nm torque (TN, August 2018). On the second hill climb up Balmanno Hill; a climb on the M90 southbound from J9 at Bridge of Earn up a 3.6 mile stretch with a 7% rise, it topped out at four minutes 18 seconds, two seconds behind the same Actros1 and DAF XF480 (TN, November 2018). There is also a neat little trick for drivers that run on A roads where it changes frequently between single track and dual carriageway. Cruise control has two pre-set speed functions that the driver can set up. On the Edinburgh Bypass A720 the first pre-set speed was 50mph and on the A702 towards Abington the second pre-set was 40mph for the single track road. Most of the attention, though, was whether the hoo-ha to get a flat floor in RHD here was worth it. Internal height is 2,104mm at the back of the cab, and where the driver stands between the seats its 2,053mm. Both figures go either side of the Scania S650 (TN, September 2018), which is 2,070mm, but both are not as impressive as the 2,130mm standing height in the Mercedes-Benz Actros GigaSpace. Range T High has four steps up to the cab, in total 1,249mm from the bottom step, which is 31mm lower than the GigaSpace. As a single bunk cab with additional storage on the backwall, there is 1,524mm headspace above the mattress, and from the storage above the windscreen to the backwall it is 1,260mm. To give the interior a glow it has the Ultimate Alu finish. The driver has the leather air-suspended seat with adjustable lumbar support, adjustable seat cushion extension, the seat can be heated or switched to ‘anti-perspiration ventilation’, and has two armrests. Storage features heavily with a 40 litre refrigerator in central storage as well as two storage boxes under the bunk, one of which is accessible from inside the cab and from the outside. Aforementioned storage above the windscreen and on the backwall is ample, and well designed. What is more the fit and finish is good; the materials feel solid, the layout of the dashboard is creative, as you can move the switches around to suit yourself, and little things like the remote control for operating the ‘media centre’ from the comfort of the bunk, makes life just a little easier. Historically, Renault Trucks flogged the Premium to anyone and everyone and the ‘Magnum’ was little more than an afterthought. Having now spent a day in a Range T High, it’s clear that bringing the RHD version to the UK was the right decision. 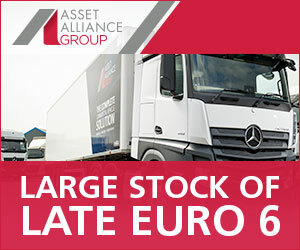 It puts Renault Trucks on a par with all its competitors in the UK who offer a range of trucks and cabs that cater for all sectors. The Range T High is comfortable, easy to drive and spacious. Its driveline is strong, and the Optivision works well. Overall, it is a sum of its parts, and that is some achievement. 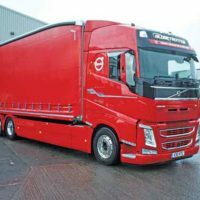 THE FIRST RHD Range T High to be ordered in the UK was by road marking haulier Tim Doody, based in Haltwhistle, Northumberland. The T520 6×2 tractor unit was supplied by Renault Trucks dealer Border Trucks. Pat says: ‘The driver absolutely loves it, he’s out Sunday and comes back Saturday and finds it comfortable and quiet. I was surprised at how big the truck is, it feels gigantic when you’re inside it.